The powerful capabilities of Group Policy can help you secure and unify your enterprise operations. But, in large organizations, especially with several Active Directory administrators, managing Group Policy change using native tools can be challenging—and can provide inadequate control. This white paper describes three significant issues with Group Policy change management using native tools: Boundary control, direct access to the live environment, and recovery from problems. It also describes a solution for applying best practices for change management to Group Policy, improving the security and availability of your IT environment. 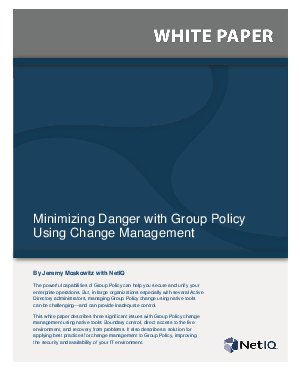 In addition, this white paper describes how NetIQ Group Policy management solutions can be leveraged to apply best practices for change management to Group Policy, improving the security and availability of your IT environment.